Video, Security, and Automation under one unified platform powered by a natural and intuitive user experience. Alula provides modern, affordable, and easy to use solutions for today’s security professionals. Alula allows the security dealer to deliver the best experience for the needs of today’s modern security customer, by providing the hardware, software, and services for a complete, end-to-end professional security system for the professional security dealer. 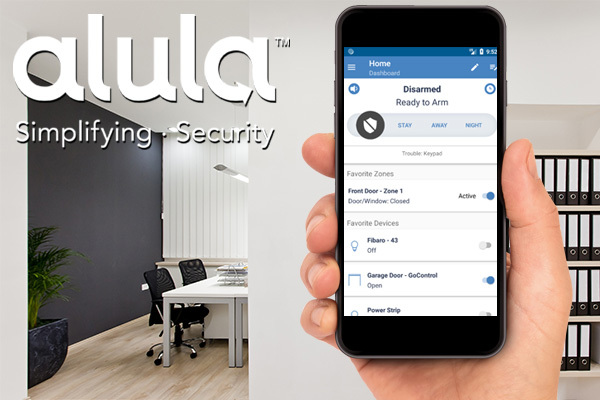 Alula App combines a seamless experience through alarm systems, smart devices, and video in one app. Connected Security via a modern, scalable, wireless platform that reduces installation time. Video Solutions that are affordable and easy to use for home and business owners. Industry-leading Internet, Cellular, and Dual-Path communicators that are future-proof, fast, and reliable. GMS accepts alarm communication solutions from iPDATATEL, now Alula. Alula provides alarm communication solutions through a broad selection of single and multi-path alarm communicators, enabling easy and cost-effective system takeovers.